Is Edgewood Avenue Ready For A Makeover? Murray Hill's Edgewood Avenue is uniquely positioned to reap the rewards of a context-sensitive street redesign - a low-cost solution that enhances safety and mobility options, while providing lucrative economic development opportunities. Community stakeholder participation will be the key determinate as to whether such an infrastructure project will come to fruition. Edgewood Avenue serves as the main commercial corridor for Murray Hill- a moderate-density, mixed residential and commercial neighborhood. Edgewood also provides a direct link to the nearby Avondale neighborhood as well as highway access to Interstate 10. Over the past five years, new businesses have opened along the thoroughfare, attracted to Edgewood Avenue due to its proliferation of available building stock and location to residential neighborhoods with attractive demographic characteristics. The physical form of Edgewood features a four-lane collector road, which for the most part is lined with low-scale buildings with storefront facades oriented to the street with no setbacks. Parking is served by public, on-street stalls as well as private parking lots located behind or to the side of buildings. Over the last few decades businesses along Edgewood were primarily service-related establishments, however since 2010 the mix of businesses have increasingly shifted towards a strong retail and entertainment focus. Opened in 1949, the Murray Hill Theatre serves as an anchor for businesses clustered around the intersection of Edgewood Ave and Post St. Businesses within the Theatre Block like Vagabond Coffee and Dreamette will soon be joined by the likes of Jeux De Jax and French Pantry. 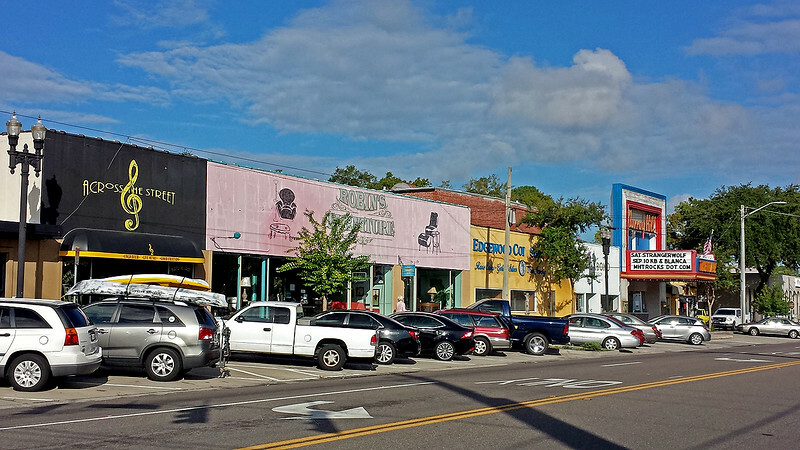 Two distinct clusters of businesses have formed along Edgewood centered around the First Block and Theatre Block areas. In between the First Block and Theatre Block, new businesses have opened albeit in a more spatial distribution. The absence of a coherent cluster of complementary uses along this stretch of the roadway creates a hole in the walkable fabric of the street. The area located northwest of the Theatre Block is defined by mainly empty storefronts. Although a clear line of sight exists from this area to the Theatre Block, the vacant nature of the street and the presence of large gaps between buildings is not desirable from a walkability perspective. US housing preferences are undergoing a long-term shift away from auto-oriented, single family suburbs, and favoring walkable, mixed-use neighborhoods. Almost two-thirds of millennials and more than half of baby boomers prefer to live in walkable neighborhoods. As Edgewood Avenue forms the backbone of Murray Hill, it would be desirable for the street to meet the needs of all the diverse users of the neighborhood- pedestrians, cyclists and automobiles. Making simple changes to enhance the walkability of the area would bode well for the sustained, long-term health of the surrounding neighborhood. When examining the deficiencies of Edgewood’s physical form, one may begin to see that simple changes are needed to enhance mobility choices while complementing and reinforcing community character, livability, and sustainability. 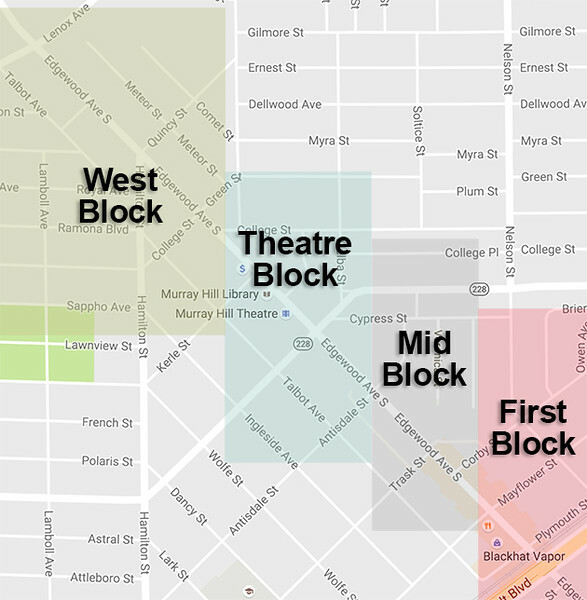 In order to tie in the isolated areas between the First Block and Theatre Block clusters and encourage redevelopment northwest of the Theatre cluster, Edgewood Avenue would greatly benefit from a context-sensitive street redesign. Two clusters of complementary businesses exist along Edgewood surrounding the First Block area as well as the Murray Hill Theatre. 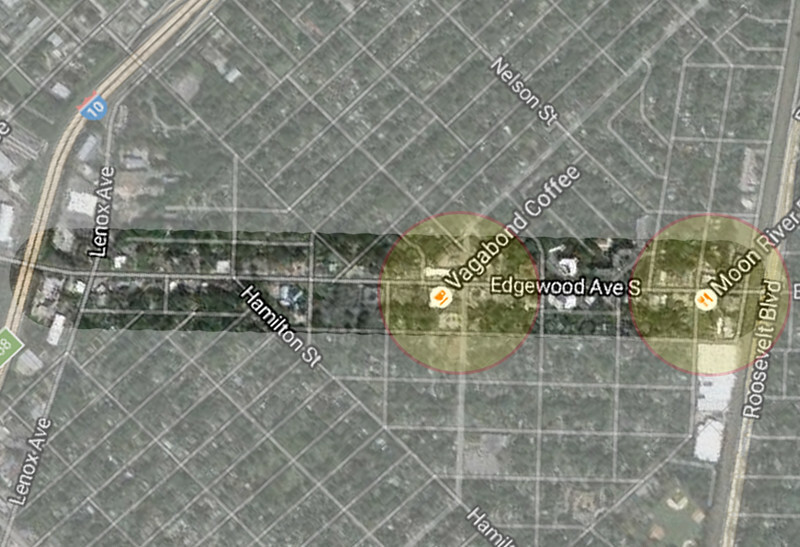 This image depicts a 1/8 mile radius around each of these two clusters. Whenever a mix of destinations are further than 1/8 mile apart, the chances of someone walking between them goes down proportionally. Infrastructure improvements that physically tie these areas together and encourage commercial infill can have a dramatic impact on strengthening Edgewood’s walkable corridor. A simple reconfiguration of the existing roadway offers a business-friendly way to reduce vehicle speeds, increase parking supply and accommodate a higher concentration of pedestrian and bicycling users without reducing traffic capacity along Edgewood Avenue. These simple changes can not only physically tie in the roughly 1-mile-long commercial district, but similar efforts in countless other peer communities have been shown to increase property values, generate additional local tax revenue, spur business development opportunities and enhance the quality of life within the neighborhood. Such a reconfiguration could be accomplished by simply restriping the lanes in conjunction with a scheduled resurfacing project, as was the case with the enhancements to San Marco Square completed in 2013. NEXT: WHAT IS A CONTEXT SENSITIVE STREET?